Cleaning mold walls is quite a task. You need to remove all the mold or it could just grow back again and spread. Understanding best how to remove mold from walls can save you time and energy, plus get your house safe again. The best way to clean moldy walls depends on what the walls are made from – nonporous walls can often be scrubbed clean with detergent. When deciding how to clean mold from walls that are porous, though, like drywall, it may work best just to remove the moldy drywall and replace it with new. Scrub the moldy walls with a mild detergent (one that does not contain ammonia or bleach, unless you know those cleansers won’t harm your paint) and water. Scrub thoroughly with a scrub brush, then rinse with clean water. Some sources do recommend using a mixture of bleach and water or hydrogen peroxide and water but a non-ammonia based cleanser should do the job just as well and will not have harmful fumes for you to breathe and will be less likely to damage your paint job. If you want to use bleach or hydrogen peroxide, test it on a small, less–visible area first. 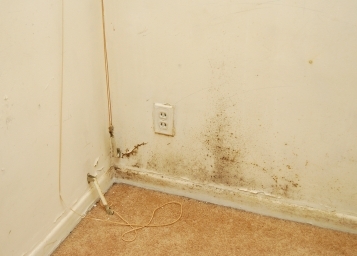 It’s more difficult to scrub mold from walls that are porous, like dry wall. If there is only a small bit of mold on the walls, you may be able to scrub it off. Most likely, you’ll need to remove and replace the moldy dry wall or other surfaces instead of cleaning the mold away. You can spray the walls with water before dismantling them to help prevent mold spores from flying about in the air while you cut and handle pieces of dry wall or sheetrock. Insulation behind the drywall may also be moldy and may need replaced. It can be quite a job. Dispose of the moldy wall material by throwing away the pieces you take down. Wrap the pieces in plastic bags to help contain mold spores. Since this method gets rid of all the mold walls, while it may initially sound like more work than just scrubbing the walls, it may save you time and effort in the end. You’ll have to tackle these mold walls by scrubbing because you can’t reasonably remove and replace a section of concrete or brick in your wall. Use a non-ammonia or non-bleach based cleanser and scrub well. Then allow the area to dry thoroughly. If the walls in question are in a cool, damp area like a basement, you might want to invest in a dehumidifier. They are not very expensive and will keep the area from becoming damp and therefore conducive to the growth of mold. You also want to repair any leaks in the roofs, around windows or around foundations where water gets inside the house. Moldy walls look unattractive, smell bad and may provide a medium for germs to grow that can contribute to illness, so it’s worth your while to take all possible steps to eliminate the mold. Of course you can call in a professional to handle the job for you if you want to be sure the job is done right. Often homeowners insurance will cover the cost of hiring a professional. If you decide to go that route, find out what kind of guarantee they offer and make sure you get it in writing. You could also just ask the professionals how to remove mold from walls but then do the job yourself. We recommend calling a professional if you have mold on porous walls, like drywall, unless you are skilled at removing and replacing drywall. 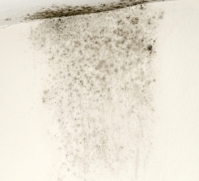 We recommend calling a professional if you have mold inside your walls as well as on the outer surfaces of the walls. If you have respiratory problems or a disorder of the immune system, we recommend calling a professional so that you are not exposed to further health risks. Most mold removal professionals offer free consultations, so you can discuss your situation at no charge. They will assess your home and provide you with a written estimate of the work that needs to be completed and the cost. Even if you think you want to clean up the mold yourself, you can gain valuable advice from a free consultation. For a list of mold removal professionals near you, just follow the link.